The FieldGo C3 is the latest entry in the portable category. The unit exterior is much lighter and slimmer relative to most portables on the market allowing it to fit inside standard traveling luggage. The materials used to construct the chassis focus on the unit's durability with an aluminum outer shell equipped with rubber corner blocks for shock absorption. Furthermore, protection for hard disk drives is taken into consideration as the FieldGo C3 also comes installed with a shock mounted 3.5" drive bay. Similar to most portables the FieldGo C3 has three HD monitors attached. 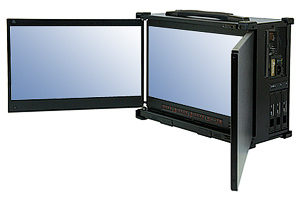 Each individual monitor measures 17.3" in size and runs clone mode at 1920x1080p resolution. If desired, the three monitors can also be used to run an extended desktop at a resolution of 5760x1080p. Although the FieldGo C3 is more compact compared to other portables, expansion options are readily available to the user. For internal expansion options, there are 7 expansion slots built with card stabilizers readily available to accommodate any PC add on cards the user wishes to install. As for external expansion options, there are multiple drive bays that are customizable to grant the user additional configurations. 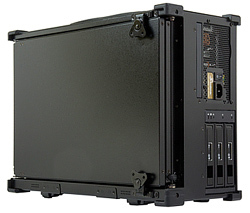 There is 1 slim optical bay and 3 open 5.25" drive bays. Two of the larger drive bays can be adjusted to fit three 3.5" removable HDD's or eight 2.5" removable HDD's. Since the FieldGo C3 has a much more compact design, mobility is enhanced which in turn broadens applications, giving the user more flexibility overall. Components used to assemble the unit are standard and can be found off-shelf which can optimize costs without having the need to sacrifice performance.